Dancers from The Royal Ballet, English National Ballet, Sir Matthew Bourne’s New Adventures, BalletBoyz and Strictly Come Dancing performed. The evening raised invaluable funds to support vital research into new treatments to prevent preterm birth. 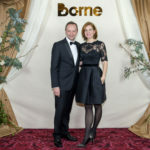 Darcey and Michael were joined by Borne Patrons Will and Caro Greenwood, Borne Ambassador Greg Rusedski and 250 guests of the charity Borne. The magical Paul Hamlyn Hall at the Royal Opera House was the venue for a unique evening of dance by performers from Strictly Come Dancing, The Royal Ballet, English National Ballet, Sir Matthew Bourne’s New Adventures and BalletBoyz, all on the same stage for one evening only. 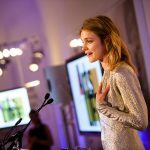 Hosted by Dame Darcey Bussell and BalletBoyz co-founder, Michael Nunn, the evening was attended by some 250 guests, united in their support for Borne’s pioneering research into the prevention of preterm birth. Preterm birth affects 15 million babies worldwide. According to the World Health Organisation, it is the leading cause of childhood mortality in the world today and leaves many babies that survive with lifelong disability. Dance illustrates the beauty that humankind can achieve, given the opportunity. By supporting Borne, a charity close to my heart that is funding vital research to stop babies from being born premature, we can give so many more the opportunity to reach their full potential, unaffected by disability. I know from personal experience how life-changing it can be when a child is born with a disability. Preterm birth is linked to many lifelong disabilities such as cerebral palsy, chronic lung disease and other debilitating conditions. This evening is about supporting Borne’s life-saving research on preterm birth, and shining a light on this overlooked and underfunded area of need that leaves many children with a disability. Thank you to everyone who made the evening a resounding success!